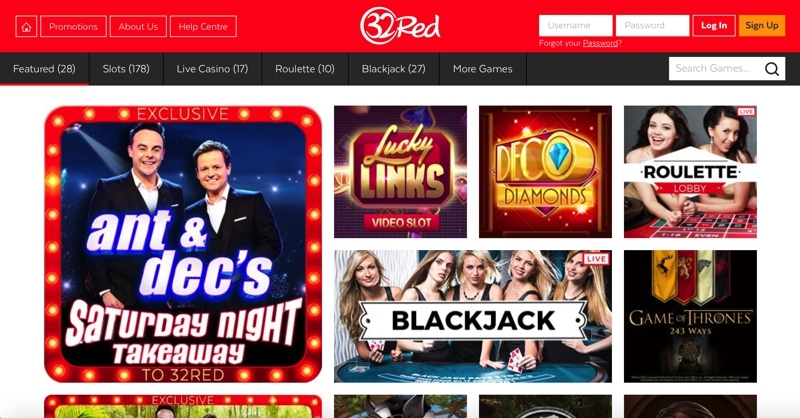 32Red are one of the giants of the online casino world and with sites available in 13 different languages they are a truly global casino. Accounts can be operated in British Pounds, as well as US, Canadian and Australian Dollars and in addition to the main and live casinos the company offer sports betting and their poker and bingo suites. They are multi-award winning, with numerous “Best Casino” titles, prizes for Player Support and, the one which they are most proud of, Best Online Casino of the Decade, awarded by player advocacy and watchdog site Casinomeister. The company are British, although they are based in Gibraltar, one of Britain’s overseas territories, and since 2005 have been listed on the London Stock Exchange. They are licensed and regulated by the Government of Gibraltar and in addition are recognised by eCOGRA as a “Safe and Fair” casino, as well as boasting various other industry seals of legitimacy. All of their offerings, be it poker, bingo or the casino are highly polished, with their experience (the site was founded in 2002) shining through. They have recently moved into sports betting and through shirt sponsorship deals with Premier League football sides, first Aston Villa and then Swansea, they have sort to quickly promote their brand. The ability to engage in such expensive sponsorship arrangements is a good indication of their financial stability and clout and yet another sign that this is a trustworthy company. All in all we have very little to say against 32Red. Their Microgaming-powered casino has a huge range of easy to use (download or instant) games and features, including huge progressives. Their bingo, poker, games and casino offerings are equally broad and efficient and customer service is excellent, with provision by live chat, email, telephone (free in the UK, Canada, Japan, Holland, Germany and Australia), all 24/7. So 32Red, a big, fat well done to you! 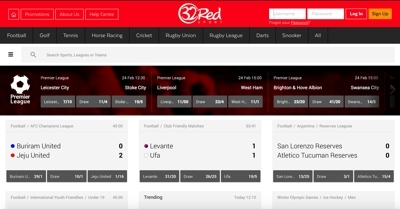 One of the latest additions to 32Red’s sports betting catalogue is that of their cash out feature, allowing you to cash your bets out before the market has been completed. The sportsbook also includes a growing live betting section along with a huge range of markets and sports to bet on from around the world. 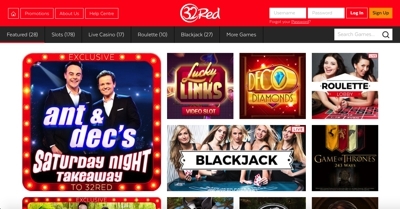 The 32 Red casino is powered by Microgaming giving them access to over 750 casino games; one of the biggest portfolios in the industry. The casino includes a number of branded licenses including Terminator 2, I’m a Celebrity Get Me Out of Here, Jurassic Park and Battlestar Galactica. 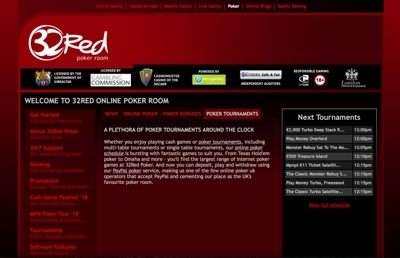 The poker room is run on the Microgaming Network and allows players to choose from a diverse range of player abilities. The software also includes a number of Bad Beat Jackpot tables to accompany features such as player anonymity, loyalty points, refer a friend bonuses, leader boards and VIP rewards. The bingo network is powered by Microgaming which means you can take advantage of features such as bonus games, monthly jackpots, weekly free cards, guaranteed pay-outs and also new games each month. 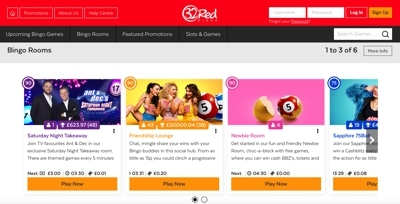 32Red also include a bingo community, which is essentially a forum for bingo players that allow you to chat to other users about games and promotions that are currently taking place.